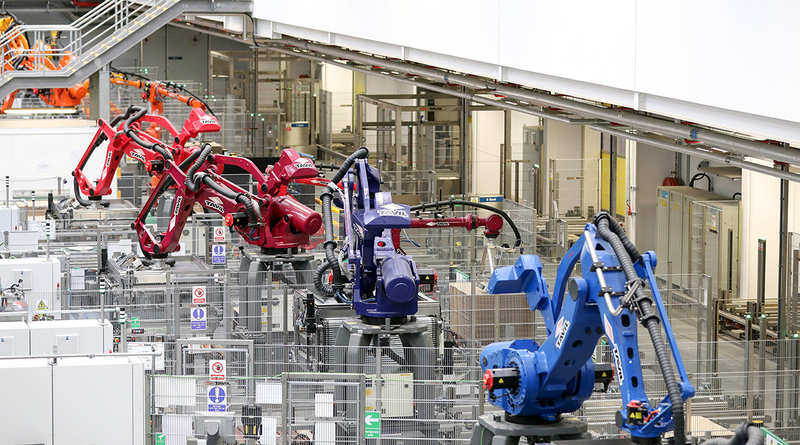 Automated robots for stacking pallets of paint stand at the end of the production line at a new paint factory in Ashington, U.K. Chris Ratcliffe/Bloomberg News. A slew of Purchasing Managers Indexes published on Jan. 2 from China, Germany, France, Italy and the U.K. all pointed to deeper supply constraints. Shrinking capacity may mean companies have to hire or invest more to avoid overheating, yet it could also force them to push up prices, propelling inflation enough to squeeze the expansion. Goldman Sachs Group Inc. and JPMorgan Chase & Co. are among the banks predicting worldwide growth will be around 4% this year, which would be the fastest since a post-recession rebound seven years ago. In the euro area, IHS Markit said “robust intakes of new business tested capacity” and there was a jump in backlogs of work as factories found it hard to keep up. In Germany, the region’s largest economy, this “poses a risk to the sector’s ability to kick on,” it said. Firms expressed discomfort as euro-area manufacturing growth accelerated to a record in December, capping a solid year for industry. With export demand strengthening, Markit’s monthly report showed both new orders and output were the best in 17 years. Germany’s gauge rose to a record and France improved. Global growth also got a boost from a solid reading in China’s manufacturing sector. With industry at its limits, there are implications for inflation in the euro region, which remains below the European Central Bank’s target of just under 2%. Bundesbank President Jens Weidmann, who wants to set an end-date for monetary stimulus, recently cited regional bottlenecks as setting the stage for stronger wage growth. At the same time, input costs remain “elevated” across a number of economies, partly reflecting higher raw material prices. In China, the Caixin factory PMI rose to 51.5 in December from 50.8 in November, marking the best reading in four months. The report noted faster growth of output, total new work and export sales, as well as an increase in backlogs of work. An official PMI weakened slightly, though remained above the key 50 level that signifies expansion. China’s overall economic growth may slow in 2018 after accelerating last year, though the government has signaled it will accept slightly weaker expansion as it deals with what it says are “critical battles” of financial stability, poverty and pollution. Still, the global economy is forecast to expand 3.7% this year, slightly faster than the 3.6% pace estimated for 2017, according to the International Monetary Fund’s most recent projections. The euro area will cool slightly from 2.3% this year, but still record growth above 2%.